Is Anna Mary Stockum a witch searching for her head? St Johns Lutheran Church Cemetery where Mary's grave is found. Anna Mary, the wife of Christopher Stockum, died August 29, 1863, aged 42 y, Hm 2. The remaining inscription is too difficult to read. 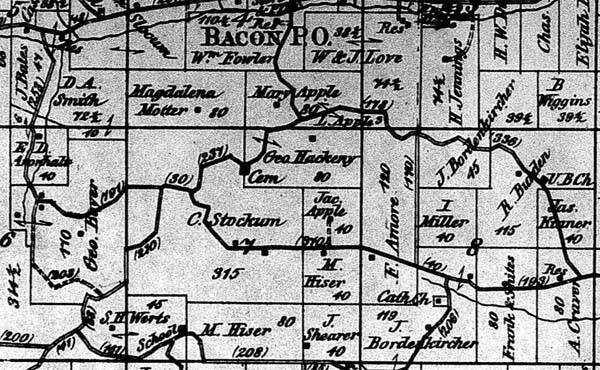 1850 Coschocton County map from Library of Congress showing the Stockum property. Cemetery is central to this 1872 map. The old road leading to the cemetery. You can see the deep green and spiky yucca that was once planted in and around cemeteries and still growing along the sides of the road leading to the graveyard.Yucca Plants are also called eternity plants because they live for hundreds of years. Such, they symbolize eternity, They also symbolize mourning. Historically, it was believed the plant kept restless spirits in their graves. Just down the road is an old building foundation. It is not listed on any maps I could find from 1850 to early 1900s. I wonder if it was the old church associated with the cemetery. Post courtesy of Haunted Hocking. 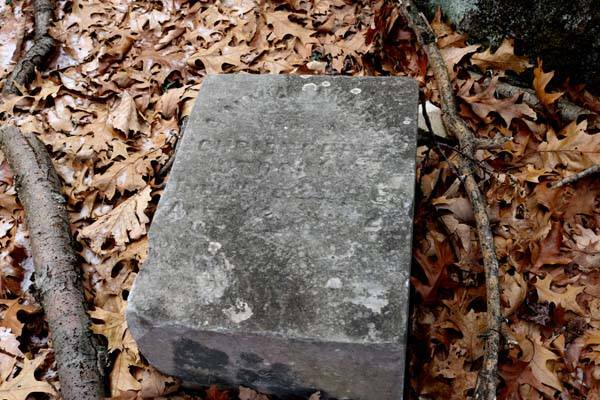 Accused as a witch, was her head severed from her body and buried in a separate grave? It’s a long, pothole-ridden, muddy drive, then a long, mucky walk. There are cliffs and drop-offs, ruts, twists, and two turns to the road that appears to stop in the middle of nowhere. The mud churned up by ATV-running hunters on the archaic County Road 123 is ankle deep in some parts, knee-deep in others. Amidst it all, to think teens have made this trek for more than fifty years in the dark is almost more terrifying than the legend. But they have. They’ve come to look for the ghost of the woman wandering around the Saint Johns Lutheran Church Cemetery searching for her head. Local folklore says it was hacked off by those within her community when they found out she was a witch. Her body was left to rot in one grave, her head taken out and buried outside the cemetery fence. You see, Anna Mary Stockum had nine children. One of them was mentally handicapped and one day, her husband decided to kill the child and, so he did. He was caught, convicted, and hanged for his crime. In retaliation for the hanging, Mary began killing off her children one by one. After the fifth one died, she too was brought to justice. Mary was burned at the stake and buried in the cemetery. Still, the remaining children she had not killed did not get better. One by one, they began to die. When the sixth child passed away and fearing the worst, the townspeople dug up Mary, as was common practice to block a witch’s curse after death. They severed her head from her body and left it in a shallow grave outside the boundaries of the cemetery. Then they plopped a gravestone on each. Now, she returns to find her head, wandering the cemetery in ghostly form. Without too much difficulty, the obsessive researcher can discover Anna Mary Stockum was the wife of Christopher Stockum. The two owned a 315-acre farm around Bacon and the area the cemetery sits upon now. They had emigrated from Hessen, Germany by ship in 1836, a grueling eighteen-week trip on the Brig Aurora and came without a penny in their pocket. They spent much of their lives pushing back the wilderness on their plot in Linton Township and building the land, which later was a valuable farm. The 1860 census shows the Stockums had seven children living in the home—Mary-18, Adam-17, Elizabeth-15, John-13, Martin-12, Caroline-11, Jacob-9. By 1870, all the children still appeared to be living. An eighth child, Solomon-9 (1861-1918? ), was also listed in the household in the census. Adam, the eldest, had returned from the Civil War to help farm the land. Caroline was the eldest daughter and she maintained the home. Many of their headstones can be seen in the cemetery still-including Jacob and his wife, Nancy, and John . . . . Only one person is missing – Anna Mary, the mother. She had passed August 29, 1863. In late August of that year, there were several other known deaths from people in the tiny community who are buried at the church cemetery. Was it simply some sort of flu epidemic? Or is there more to the story lost in time? On one hand, there is one that shows on paper the family of Mary Stockum was a typical family. They lived. They died. They were buried in a family plot on their land in Linton Township. They had neighbors by the name of Apple and Gosser, some of which are buried in the cemetery too. On the other hand, there is a tale told by word of mouth, by story passed down from one to another. It is more exciting, more gruesome and a tale of a crazy witch buried after killing her young. And there are scores of eye-witnesses from hunters to adventure-seekers who have seen the filmy apparition of Mary, heard her screams, been utterly terrified by the ghostly apparition walking around the cemetery. An article in the November 11, 1967, Coshocton Tribune by Joanna Ross points out the story was begun by the sight of two graves for Mary, hence one for the body and one for the head. A local caretaker verified it was true. However, his reason was a lot less horrifying and had a more prudent explanation. The initial gravestone was replaced by another. The old gravestone was plopped up next to the fence for lack of a better place to put it. Now the question is: which of the two stories do you believe? Will you pass the story off as local folklore, roll your eyes and chuckle a little beneath your breath at those who, over the past century, believed the hearsay? Or will you take the more adventurous position and trek into the woods like many before you, see if you can verify the ghost of Mary Stockum and listen for the screams? Because there really was a Mary Stockum and she really did die and was buried there. Hundreds of people swear they have seen her ghost, heard her yowls. 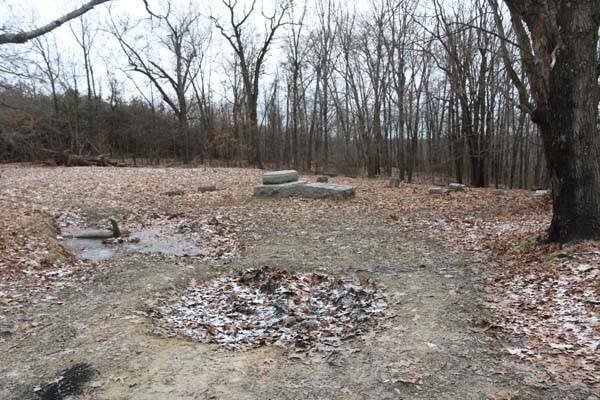 They will tell you that something is there deep in the woods at the old cemetery. If you do, the area is hazardous. It is along an old strip mine and there are cliffs and drop-offs. The road is rutted and muddy. You may hear screams, many have. You may see a milky white form along the road as some have sworn to have seen. And there could, quite possibly, be something more dangerous lurking there. Because now, we only have what is written on paper on census reports and etched in gravestones. It’s just a hint of the past and little more. There are always secrets buried beneath the dirt along with the dead in ghost towns long gone with no one still living to tell us the truth of what went on that hot August summer deep in the farmland and forests of Coshocton County. AEP/DNR public areas have rules and regulations. Many include day use activities only. However, unless you’re looking for vampires, you should have no problem searching for the unknown during daylight hours. And please, many of the graves have been knocked over by trees, vandals, and weather. Respect the dead and those who are still living who might have known them. You may need to park near the intersection of County Road 123 (on right) and 123A (left)— (40.209008, -81.785404). Take 123A to the left, walking the .4 mile back to the cemetery along the old roadway. The road curves, but it is a straight walk to the cemetery, which is on the right (40.210353,-81.779499) and within sight of the roadway. Not a suggested walk at night. There is probably day use only restrictions. Posted on February 4, 2018 by NEWCOMERSTOWN.COM. Herald-Journal: June 27, 1946 - COSHOCTON, Ohio (June 26, 1946) – Mad Marshall Jacobs was out of the running for the flagpole sitting championship today, but his girlfriend, Lonnie Cosmar, the cause of his grounding after 27 days aloft, was up there doing his sitting for him and hoping he would be back Sunday to marry her. Lonnie, according to spectators, is doing a pretty job of sitting – although she could not quite make it to the top of the 176-foot pole. Marshall put himself out of the running late last night. Lonnie a flush with the prospects of a marriage at the pole’s top Sunday with the country listening in on the radio, had just told him she was going to Cleveland to arrange for a bridal suite. Mad Marshall said she was not – that once they were married and he had broken the record by staying on a flagpole until July 4, he wanted privacy. They both refused to give an inch. So the human fly clambered down his pole and departed in a huff. Lonnie, possibly his ex-sweetheart now, assayed the situation hurriedly and talked the ground crew into hoisting her up almost to the top in a bosun’s chair where they left her dangling. St. Petersburg Times: June 30, 1946 - COSHOCTON, Ohio – Latest reports from the most reliable source indicated yesterday that June Bride Lonnie Cosmar would not be left waiting at the flagpole after all. Mad Marshall Jacobs called the United Press and said earlier rumors he would not wed Lonnie today atop his 176-foot pole at Coshocton fairgrounds were false. The wedding will be a quiet affair with nobody there but the preacher, four bridesmaids, several newsreel companies, a national radio network, a national magazine, a blimp and probably several thousand spectators. Plans have been made for the bride to be hoisted to the high-altitude altar clad in a white satin gown and a flowering veil, with the traditional bride’s bouquet of roses. Mayor Stuart Hays of Warsaw, Ohio, a veteran showman, will read the ceremony from the ground with the aid of a public address system. The bridesmaids will remain on the ground at the base of the pole. Jacobs came down from his 16-inch-square perch on top of the pole Tuesday night although he had planned to stay up until July 4. He changed his plans because his managers arranged for “a public honeymoon,” he said. While Marshall wandered over the state as far as Toledo, Lonnie climbed the pole and waited for his return. The flagpole sitter said he did not object to a public wedding but he did want privacy on his honeymoon. “I was on exhibition on that pole for 26 days. That was enough,” he said. LIFE Magazine: July 15, 1946 - Last week in Coshocton, Ohio, the U.S. turned another corner in its return to peacetime normalcy. A lovesick flagpole sitter, named “Mad Marshall” Jacobs, 37, who had been sitting on his 176-foot roost for 26 days to revive interest in his art, decided to get married. He came down to earth, proposed to his fiancée, Yolanda (“Lonnie”) Cosmar, 21, a waitress from nearby Clowville, Ohio, that they get married on the flagpole. She said yes and set June 30 as the date. On the afternoon of their wedding, they were hoisted up to the 40-inch diameter perch for a rehearsal. While the justice of the peace stood on the ground, talking through a loudspeaker, LIFE’s cameraman hovered nearby in a helicopter, the only vantage point from which to photograph the big event properly. That night they were really married before 1,700 paying spectators. Mad’s perch, which cost him $3,000 of his war-plant earnings, had all the comforts of home, including a telephone, an electric hot plate, and a chemical outhouse, but the newlyweds decided to come down that evening and spend their honeymoon on the ground. EDITOR'S NOTE: The admission price of 25 cents was thought to be high at that time because a pair of new shoes could be purchased for 5 cents. Posted on August 7, 2017 by NEWCOMERSTOWN.COM. Post Boy is one of the historic places of Tuscarawas County, and its name carries with it a history – noted as the place where a post boy, while in discharge of his official duty, came to his death at the hands of one of the most daring and reckless desperadoes that Tuscarawas County has ever known. The very mention of the name “Post Boy” carries with it the recollection of the foulest and most detestable murder ever committed in this part of the state. It was the only murder ever committed in this county in which the murderer met with capital punishment. It is now more than 62 years since the event transpired and many changes have taken place since that time, but the tragic event is still as fresh in the minds of the people as though it transpired but a few years ago. This tragedy occurred in the year of 1825, on the 9th day of September, about 150 yards west of the present site where Post Boy, a station on the C. & M. Railroad, now stands. William Cartmell, a youth about 20 years old, was in the employ of the government as carrier of the mail from Freeport to Coshocton, and it was while in the discharge of his duty that an assassin lay in ambush ready to send forth the ball on its mission, which was to shed the life blood of an honorable young man. John Funson was a young, unmarried man, a resident of Oxford Township, who was more fond of fun and sport than he was of work, and who conceived a bold scheme of how he might obtain money without labor. In those days the Cadiz and Coshocton road was one of the thoroughfares by which the stock buyers and merchants of the West found commerce with the people of the East. It was before railroads were in operation and men were compelled to travel across the country to carry on its business interests. It was along this road that John Funson conceived his bold scheme of murder and robbery. A drover, named Smeltzer, who had gone East would soon past West on his homeward tour and have in his possession a large sum of money, and John Funson had in some way ascertained the facts, and lay in ambush ready and waiting to send the man’s soul into eternity and relieve the pocket-book of its contents. But the drover was three hours late and another man was murdered by mistake. On the 9th day of September, William Cartmell left Freeport and started on his trip to Coshocton and somewhere along the road he came across a man named Johnson and the two traveled along together until they came to a spring of water by the roadside, about one mile West of the tavern, then known as Booth Tavern, and kept by Mrs. Sarah Booth, where Johnson stopped to get a drink of water while the Post Boy trudged along. He had not gone more than a hundred and fifty yards when Johnson heard the sharp report of a gun and hastening to the spot found young Cartmell weltering in his life blood, so near death that he was unable to utter a word. There while Johnson was leaning over the lifeless body of young Cartmell, a man emerged from the woods and confronted Johnson, with a remark “Do you say I killed that man?” “No,” Johnson replied, “I have not said so.” Again the stranger asked the same question, and Johnson, looking him full in the face, said, “No, sir, but somebody has killed him and we must alarm the neighbors.” “Well, you go to Booth’s and I will go to Morgan’s and tell them about it,” answered the stranger. To this Johnson objected, saying that they ought to go together. The stranger answered him with an oath, informing him he must do as he was bid or he would shoot him. This ended the parley and while Johnson hurried away and brought help back with him, the stranger returned and rifled the pockets of the murdered boy, and without making any alarm departed unseen by any one, except Johnson, so effectually, that the word of Johnson was doubted, notwithstanding his apparent sincerity. Johnson was arrested as the committer of the dastardly crime, and so strong was the belief that he was the right man that his conviction seemed only a matter of time. It is also said that when Johnson’s track was measured and found too small for the track made by the murderer that it was claimed a mistake had been made and that they would correspond. Johnson was taken to New Philadelphia and lodged in jail as the perpetrator of the horrible crime, but firmly maintained his entire innocence with such an irresistible force of character as no guilty man could command. At length people began to think that Johnson’s word might be true and that the real perpetrator was at large, but might yet be detected and brought to justice. Johnson asserted time and again that if he could see the man whom he had seen at the time the murder was committed, and whom he believed was the guilty party, that he could pick him out from among a thousand men. But fortune had yet another method of detecting the murderer. It was through the careful business methods of the Postmaster at Freeport, John I. Wilson, who kept an accurate and systematic account of all his transactions. On the morning of the murder, Postmaster Wilson had given the mail boy a $10 bill before he started on his journey to Coshocton, kept the number and an accurate description of the same. A few days after the murder had been committed a description of the bill was printed in the Tuscarawas Chronicle, then published at New Philadelphia, and went forth to do its work. It was not long after this notice appeared in print until a man named John Funson, who lived in the neighborhood of Newcomerstown, went to Shanesville to get his gun repaired, and tendered the gunsmith in payment for the work done, a ten dollar bill. This gunsmith in turn went to one of the dry goods stores of that place and gave it to the merchant in payment for goods bought. This merchant, who kept himself tolerably well informed in regard to current events, at once recognized the bill as the one advertised by the Postmaster at Freeport to be the bill belonging to the murdered post boy, William Cartmell. This merchant went to the gunsmith and made inquiry in regard to whom he had received the bill from, and learned the facts, that he had received it from John Funson, of near Newcomerstown, in exchange for work done. Now people began to suspicion that Funson might be the guilty man and Johnson’s assertion that he could pick out the man whom he met at the scene of the murder from among a thousand men, induced the citizens from all parts of the county to assemble at New Philadelphia on a certain day. But the great object in view was that Funson might be one of the number. On the day before they were to go to New Philadelphia there was a gathering in the neighborhood of the Funson homestead, and John Funson was among the number present. While some of the parties there were conversing about the proposed trip on the morrow Funson emphatically said he did not intend to go. Some of the men present spoke up and said to him that if he did not go the people might think he was the guilty man. This saying induced Funson to go without further parley. When the people assembled at New Philadelphia they were formed in a procession along one of the principal streets, with Funson at the farthest end. Johnson was brought forth from his cell and allowed to view the mass of humanity there assembled, to see if he could find the man whom he had seen at the time the tragedy occurred by the lonely roadside in Oxford Township. When Johnson raised his haggard face to view the men, silence fell upon the crowd, and all eyes were at once fixed upon the prisoner. It was a trying time for Johnson because upon his recognition of the real murderer hung the slender thread – a possibility of liberty or death. At length his eyes fell upon Funson and turning to the officers present exclaimed, “That is the very man.” “You are a liar,” replied Funson. “You are the very man, I know your voice,” reiterated Johnson, and turning to the officers who were with him, told them of a scar they would find upon the wrist of the man. If the scar the scar was not there as described by him he would acknowledge himself mistaken. Upon examination the scar was found just as Johnson had said it would be. Funson was arrested and lodged in jail. The proof was now so strong that Funson was the right man, that Johnson was released and went to his home in the vicinity of Steubenville; but the shock was so great to his system that he never fully recovered from its effects and died shortly afterward a broken hearted man. Funson was found guilty of murder in the first degree by the grand jury which shortly afterward convened. He was tried at the November term of court upon the indictment, Judge Alexander Harper, of Steubenville, presiding. The prosecuting attorney who prosecuted the case was B. M. Atherton, assisted by John M. Goodman. The prisoner was defended by Walter B. Beebe and S.W. Culbertson. But the evidence was against the prisoner and he was found guilty as charged in the indictment, and in atonement for the crime was sentenced to be hung on the 30th day of December, 1825. The sheriff who was to carry this sentence into execution was Walter M. Blake, who filled several positions of honor and trust, and died in 1865. As time wore on after the finding of the court and the sentence of the Judge it was supposed that Funson would make a confession, which he did on the morning of the fourth of December to Judge Patrick, who was at that time editor of the Tuscarawas Chronicle. This confession was full of remorse, the prisoner even going so far as to say after he had killed the mail boy, that he would willingly have given his own life if he could have only restored the life he had taken. Upon on occasion when John Funson was away from home without money and without friends, he was taken sick but came across William Cartmell, who took him to his home and cared for him until he was able to go to his own home. Thus Funson paid the debt of gratitude and benevolence with murder. The scaffold on which John Funson was hung was erected on a slight elevation just west of New Philadelphia and which is at the present time a suburb of the county seat. On the morning of the execution the citizens from all parts of the county and some from distant parts of the state began to assemble at New Philadelphia, and by morn the streets were a solid mass of humanity, all eager to witness the law imposed duty of seeing John Funson launched into eternity. Shortly after noon the sheriff did his duty and the lifeless body of John Funson hung to the breezes. After life was extinct the body was turned over to his two brothers who took it to their home east of Newcomerstown and buried it near their father’s residence, and fell two large trees across the grave. 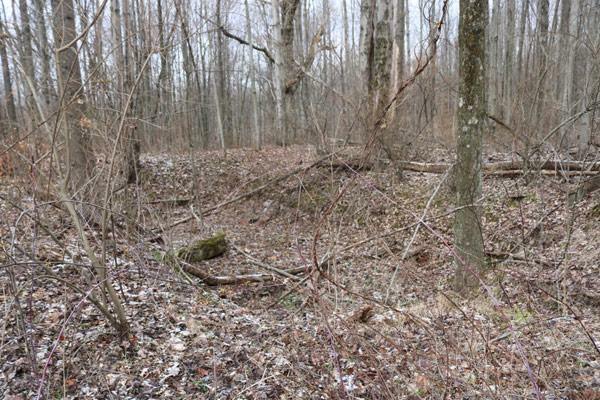 This spot which marks the last resting place of John Funson is about one hundred and fifty yards northwest of the Ohio Canal, and looks as though it might have been the place where a tree had once blown out by the roots – a slight elevation and then a depression. The decayed bodies of the two trees may yet be seen lying across the grave just as they were more than 60 years ago. Just how long John Funson conceived his scheme of murder and robbery before he carried it into execution is only a matter of conjecture and that secret he carried with him to the grave. But at any rate, from the circumstances surrounding what is already known it must have been for some time. The gun with which he killed William Cartmell he secured from John Hursey, who lived on Dunlap Creek, in Washington Township, about ten days or two weeks before the murder was committed. After Funson was arrested and had paid the penalty of death, the father of John Funson took the gun back to John Hursey and got the one his son had left in exchange. Anyone passing along the Cadiz and Coshocton road past the spot where the post boy was murdered will see the letters “J. F.” cut in a small tree by the roadside and directly under the letters, the figures “1825.” These letters stand for John Funson and the figures for the year in which the murder was committed. This tree stands directly opposite the spot and but a few feet distant from the place where William Cartmell met his death. He sought his own ruin by seeking a prize. He made his way home through a thicket of woods. Hearing the reports advanced on the spot. Of money he had taken from the murdered boy. I heard young Cartmell halloo and advanced to the spot. Unto New Philadelphia his actions to try. You shall hang by the neck, sir, until you are dead. He called on the judge to confess what he had done. I would give my own life to restore him again. He was dressed in a shroud that was awful to see. To haul the dead body of their brother away. Thinking when buried his body to steal. It’s an end to my song, and I will bid you good night. Posted on August 3, 2017 by MICHAEL A. WISE. When stories are handed down from generation to generation, those stories sometimes turn from history to folklore. Such is the case with the 175-year-old tale of the “Postboy Murder.” Although the murder of the mail carrier and the prosecution of his murderer are in no doubt facts, many other details gathered on the events through various sources are sometimes suspect. Many articles have been written on the subject for whom the small community of Postboy gets its name. With the resources that I have available at this time, I would also like to add my version. The tale took place in the year 1825. The construction of the Ohio Erie Canal had only just begun. Transportation in the young state of Ohio was slow and required lengthy treks through rugged hillsides and thickets. Mr. John Cartmell had built a cabin on the eastern edge of Coshocton and had contracted with the authorities of the time to carry the mail from Coshocton to Freeport. His son William was eager to take part in his father’s business adventure and was soon traveling the mail route on his own. The exact age William Cartmell at that time is not available but he is often described as a young man, and a mere lad. 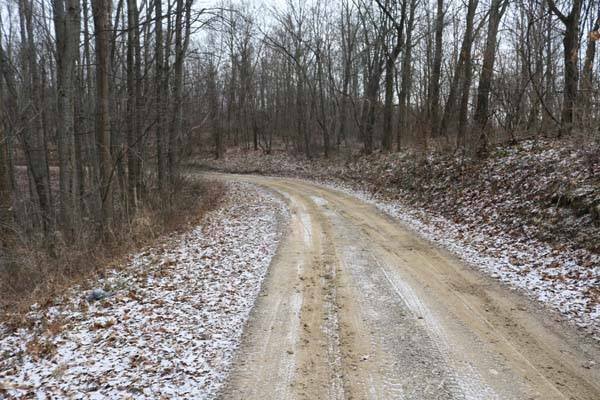 The main road from Coshocton to Cadiz and Wheeling, Virginia was called the “big road.” It was a thin dirt path that was full of hardship and held danger at every turn. The thought of a “mere lad” on this route alone in those days is hard to imagine, but it was on this road that young William was forced to travel to deliver his mail. In those days traders called drovers would drive their products eastward to the Ohio River and sell their goods that were destined for the eastern states. These drovers also used the big road. One of the more successful drovers of that time was a man named Smeltzer. His business was widely known along the trail. After delivering their goods to the east, these drovers would usually be paid in silver and large amounts of this precious currency would be carried in large saddle bags as the drover traveled back to his home on horseback. The Postboy, William Cartmell also traveled by horseback and because the mail that he delivered was also carried in saddlebags, it is easy to see how he could have been mistaken for a drover. On this particular mail delivery in September of 1825, young Cartmell would befriend a man named William Johnston. Not much is known of Johnson except that he was from Steubenville and was also heading west toward Coshocton. Cartmell and Johnston seem to have developed a friendship at some time during the trip, perhaps at the tavern located on the big road about fifteen miles east of Coshocton. During the long trips along this road travelers would often stop at the friendly tavern to spend the night. On the night of September 8, 1825 Cartmell and Johnson spent the night at the inn and departed the tavern together early the next morning on September 9. A few miles east of the tavern lived John Funston. Funston is described as a farmer and he and his family “squatters.” They lived in a hollow a few miles east of the tavern. They were a dirty lot and not well liked or trusted. Three grown men occupied the shack and John Funston was the worst of the three. He was lazy and selfish, a tall thin man of 26 years. He was never seen without his long rifle. A local man who needed help on his farm had offered him honest work, but Funston chose an easier way to earn a living, a dishonest way. Cartmell and Johnston began their morning journey, they had only traveled about one mile from the tavern before Johnson became thirsty and stopped by a natural spring to get a drink for himself and perhaps for his animal. Some accounts say Johnston was on foot. Cartmell was on horseback and continued eastward toward his home in Coshocton County. As Johnson knelt by the cool spring, he was startled by the sound of a loud shot. Johnston hurried in the direction of young Cartwell but it was too late, the young man lay dead in the road. He had been shot in the back and his mailbag was gone. Johnston feared for his life and appeased the man by saying, “No, I don’t know who did it.” But Johnson did know. He kept his eyes on the stranger at all times. He also noticed a scar on the Funston’s hand. Funston wanted to make a getaway and suggested they should split up. He told Johnston to go back to the tavern to tell the occupants there while he would go on westward to the next farmhouse. Johnson agreed and hurried back to the tavern. The proprietor and others at the lodge were summoned to the murder site but “the other man” of whom Johnston spoke never appeared. This fact led many to accuse Johnston of being the murderer. Soon Johnston found himself fettered hand and foot in the Tuscarawas County Jail at New Philadelphia. Johnston’s constant plea of innocence and the claim he could identify the real murderer led the authorities to invoke a “writ of Posse comitatus” or Power of the County. All of the adult males who lived in the immediate area of the murder were summoned to the county seat and lined up in front of the jail. Johnston was brought out still in shackles and walked along the line of men. If he were not able to identify the killer it would probably mean his life. Funston was in attendance because if he had not appeared the suspicion of guilt would have been pointed at him immediately. During the lineup, Funston had tried to shrink back out of the line and became fearful as Johnston approached. “You are the man!” Johnston shouted at Funston. “You are a liar!” Funston replied. “Now, I am certain when I hear you talk,” said Johnston. The identification was complete when the scar on Funston’s hand was discovered and other evidence was revealed such as a ten-dollar bill that was known to be in the postboy’s mailbag. Johnston was released and Funston went on trial on November 16, 1825. Within three days a jury had found Funston guilty of murder and Judge Alexander Harper pronounced the sentence of death and set December 30, 1825 as the date for the execution. On December 28, Funston attempted to hang himself in his cell with his suspenders. The attempt failed and Funston received a severe head injury for his trouble. When he revived, he made a full confession of his crime to Judge James Patrick. Funston said he had mistaken the Postboy for the rich drover named Smeltzer. On a cold and rainy December 30, a large crowd watched Funston hung from a gallows built by John B. Sappington. The carpenter was paid $10 for his handiwork; David Miller provided two ropes for $1.62 and ½ cents. Funston was led to the gallows followed by a wagon that held his coffin. Sheriff Walter M. Blake stood by with a watch and an ax. At the appointed time he used the ax to cut a rope that held the trap door beneath Funston’s feet. Funston became the only person ever executed in Tuscarawas County. The weather at the time of the hanging was said to have been so terrible that some who attended it died from exposure. Funston’s body was taken by his two brothers back to Newcomerstown and was secretly buried on their farm about three miles east of town. During and following his incarceration, William Johnston experiences severe emotion trauma. Although he returned to his home in Steubenville, he would continue to suffer emotional breakdowns and died within the next year. The Postboy, young William Cartmell, was buried near his father’s home outside of Coshocton. Years later a plow operated by William Sprinkle unearthed the small skull of the Postboy. A large oak tree on a sharp curve once marked the spot where the murder was said to have occurred. Today, on Postboy Road in southern Tuscarawas County, the tree is almost gone and only a twenty-foot trunk of it still remains. In later years the small community of Postboy grew prosperously for a short time with a local lumber industry, a station on the Cleveland and Marietta Railroad, and a general store. Today, Postboy is a small farming community that is known for its treacherous winter roads. In 1825 the roads were also treacherous and the story continues to be told. Posted on August 3, 2017 by NEWCOMERSTOWN.COM. 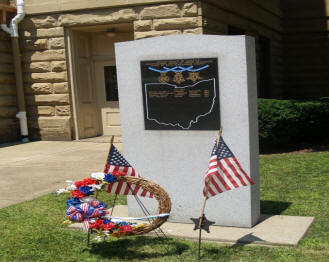 Article and photos courtesy of Tuscarawas County, OH at http://www.co.tuscarawas.oh.us. On March 15, 1808, Tuscarawas County became the 27th county to be officially recognized by the State of Ohio. Early meetings of the county officials were held in a local tavern and on June 28, 1808, the County Commissioners authorized the building of a two-story structure with a jail on the first floor and county offices on the second. A contract for this log building which also served as a church was given to Peter Minnich for $1,500. It was 30' by 40' and was constructed on lots provided by New Philadelphia founder, John Knisely. In 1818, the county had outgrown the building and the Commissioners advertised for a new building. It was not completed for seven years and the contracts totaled $7,468. When the 1825 Commissioners had financial difficulties, they rented an upstairs room in the building to the Masonic Lodge #59 for $12 per year. The architecture of the building was like that of the original state capital building in Chillicothe. Most of the first floor was used as the courtroom. The Clerk and the Auditor each had one office also on the first floor. The second floor had a separate room for juries. The building was renovated in 1837 after fire damage and the courtroom occupied the entire first floor post renovation. In 1882, the county's third courthouse was designed by architect Thomas Boyd and built by T.B. Townsend of Zanesville for a contract price of $98,860. Townsend purchased the old building from the county for $900 and used the bricks for fill material for under the new building. On October 25, 1882, the cornerstone was laid after a parade longer than 2 miles which converged on the Public Square. Over 10,000 people attended the cornerstone laying ceremony. The stone for the building was from a quarry in Medina, causing a special railroad track to be built to the site of the Courthouse. The building was 96' by 112' and consisted of 38 rooms on 3 floors and an attic. This Courthouse was constructed with a dome with a statue of 3 women made from zinc or lead-like metal weighing more than 699 pounds and was 10' wide. It was called the Three Ladies of Justice and had to be removed for safety reasons in 1959. The heads of these ladies are on display in the Commissioners' Board room. Topping the dome today is a cupola which was lifted into place by a helicopter on July 26, 1973. Currently the Courthouse building houses the Common Pleas courtrooms and administrative offices of Judge Edward Emmett O'Farrell, Judge Elizabeth Lehigh Thomakos and Judge Linda Kate. The ground floor houses the County's Law Library and Board of Elections. The Courthouse is on the National Register of Historic Buildings. The second county courthouse was adorned by a weathervane in the shape of a fish on top of a ball on a long red rod, known as the "Weatherfish". Upon removing the weathervane to construct the third courthouse, large holes were discovered in the ball portion which were believed to have been caused by celebrating Civil War veterans during their returning home parade and celebration. The 1882 Courthouse houses a 1888 Seth Thomas clock with solid brass gears. It is 8' tall and has a 225 pound solid cast iron pendulum. The faces on the portions showing outside are 6' in diameter, made of glass 1" thick. The clock has to be wound once a week with the help of a small motor. The bell is rung by a hammer. 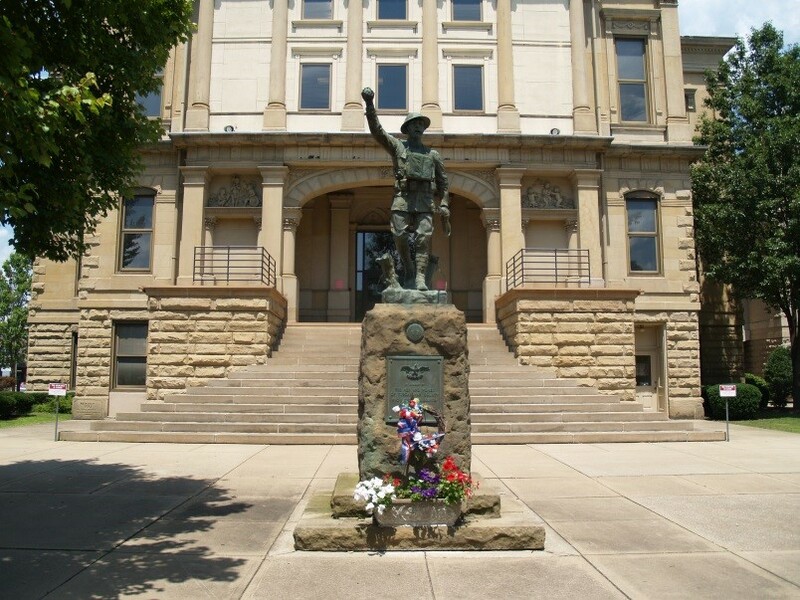 On October 27, 1990, the Tuscarawas County Office Building, adjacent to the Courthouse, was opened to the public for its dedication and open house. The building was designed by MKC Associates Inc. and has a total of 54,500 square feet. The land was obtained by the county after a fire destroyed the existing building on the lot. During 1995 and 1996, renovation was completed of the 1882 Courthouse, with design help from Fisher and Associates Architects Inc. The emphasis was to restore the building to its original splendor. The wood trim was stripped to its original black walnut color, the ceramic tile floors were cleaned and repaired, the ceilings were raised to the original 14' height and the walls were painted using historic Victorian color schemes. A canvas mural depicting lady justice complete with scales and sword was discovered beneath a lowered ceiling. It was restored and framed and is on display in Judge Thomakos' courtroom. The murals on the rotunda walls depict historical scenes in the county, a steel mill (east wall), ox drawn farm equipment and gasoline powered equipment (west wall), pioneers arriving in covered wagons (south wall) and cabins which housed the pioneers (north wall). The rotunda also features four painted portraits, which were finally labeled during the renovation and are: Colonel Mathias Bartilson, former Tuscarawas County Prosecuting Attorney and a Civil War colonel (south wall), Robert Hunter Nugen, former superintendent to the Ohio-Erie Canal, member of the U. S. House of Representatives as well as delegate to the Democratic National Convention in 1860 (east wall), George W. McIlvaine, former mayor of New Philadelphia, Tuscarawas County Common Pleas Judge and Ohio Supreme Court Justice (north wall), and Charles H. Mitchener, former Judge, and co-founder of a local newspaper "The Ohio Democrat" (west wall). 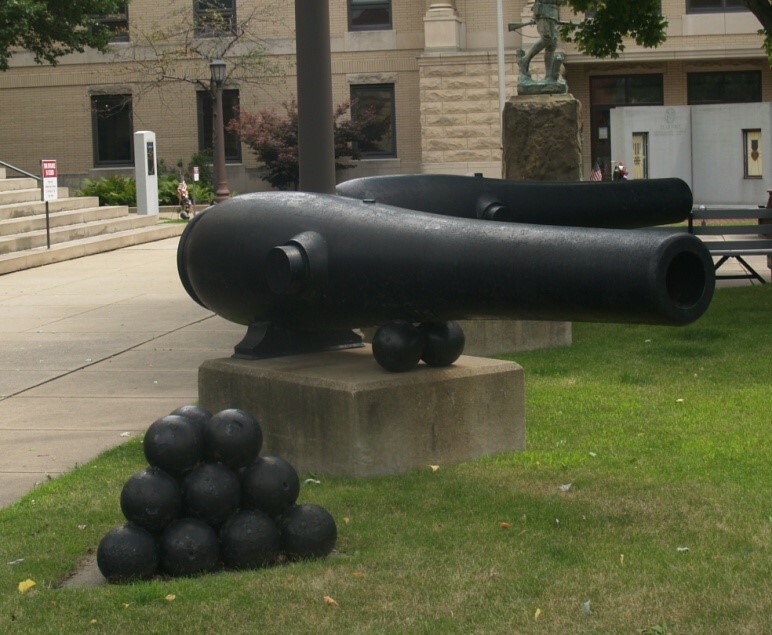 (Near North Broadway) These are original cannons that were used during the Civil War. The cannons sit on a cradle, and when in the cradle, the cannons can point to different elevations and move in different directions. The cannon balls are authentic. (Newest monument closest to East High Ave.) This commemorates the Desert Storm conflict also known as the Gulf War. (Statue right in front of the courthouse) This is a World War I statue. He is holding a grenade in his hand. 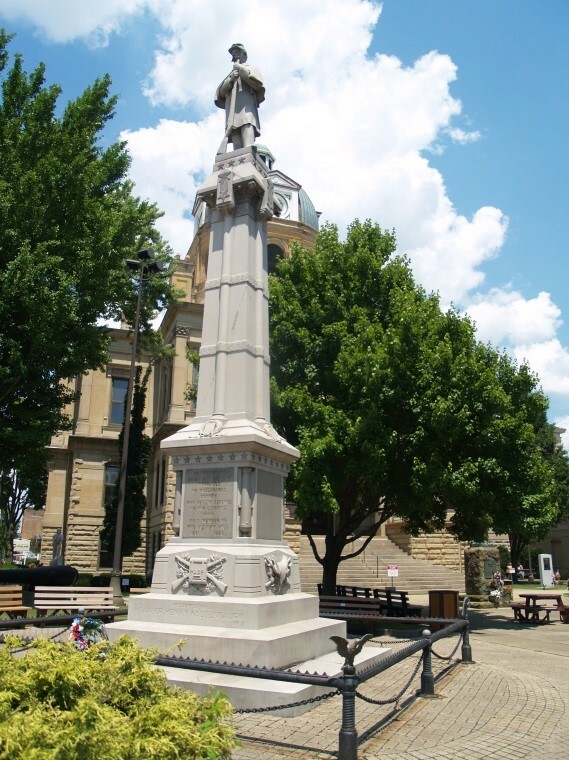 (Statue facing square) Major Henry Kaldenbaugh served in the 51st infantry division in the Civil War, and left a bequest in his will for the construction of the monument to honor GAR (Union) soldiers. 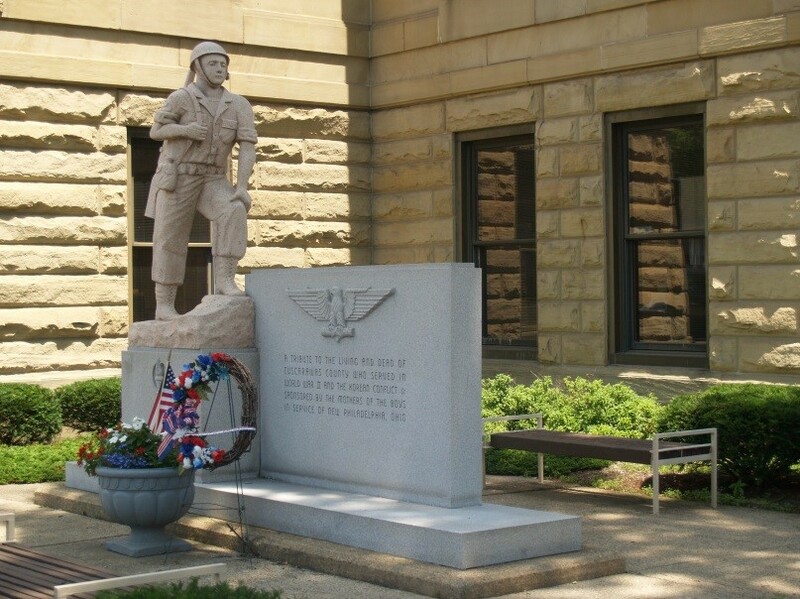 This monument commemorates Congressional Medal of Honor recipients from all wars who were from Tuscarawas County. 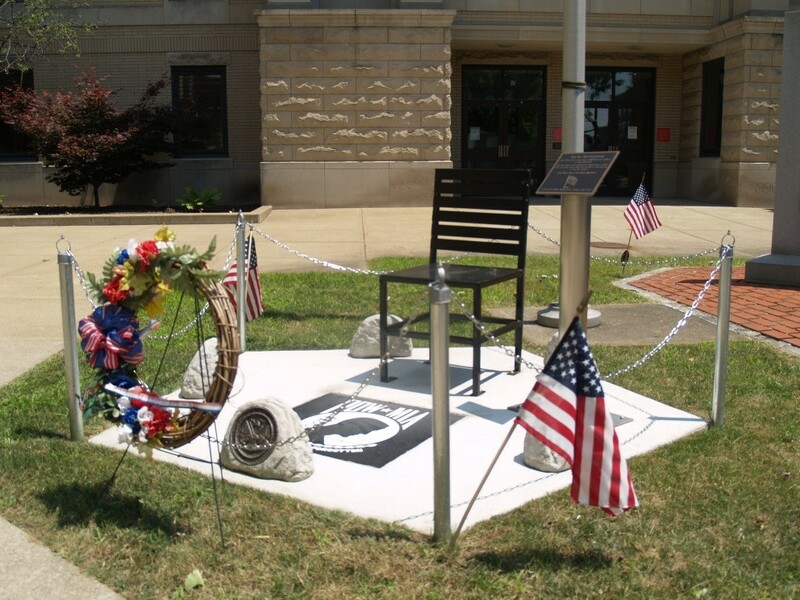 (Newest monument located near the Courthouse steps) This monument, featuring an empty chair, is in memory of all American soldiers who are unaccounted for. (Monument is beside main Courthouse steps, near the Congressional Medal of Honor Memorial) This memorial is to commemorate the Revolutionary War. 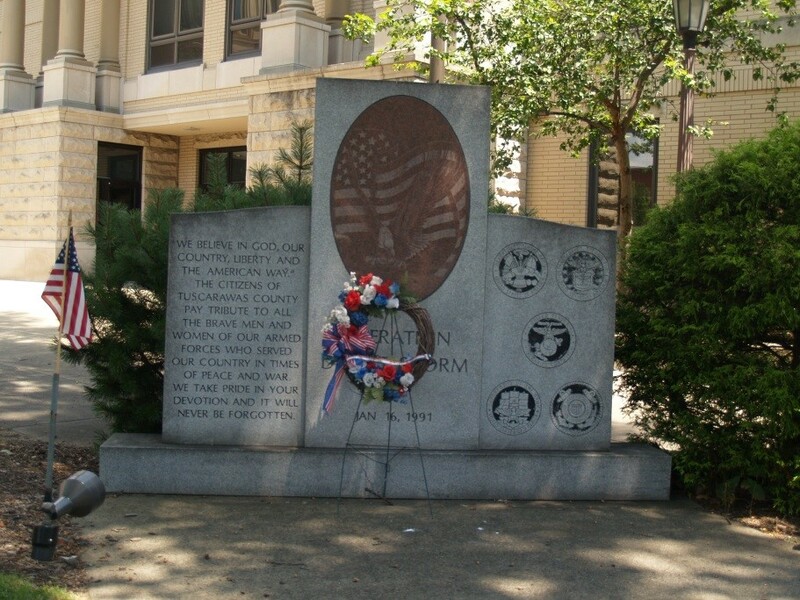 (monument directly in front of the entrance to the County Office Building.) This memorial commemorates the Vietnam War and those killed during service. Listed are those from this county that were killed during service. There is a separate wall for each division of service. (By the Board of Elections) This monument is to commemorate the WWII and Korean Conflict. Posted on July 21, 2017 by NEWCOMERSTOWN.COM. Posted on July 19, 2017 by NEWCOMERSTOWN.COM.